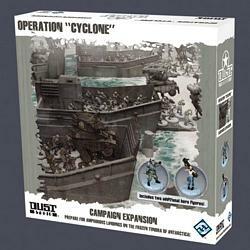 Operation Cyclone is an exciting campaign expansion for Dust Tactics, the tactical miniatures board game of explosive battlefield combat! Coming later this winter, Operation Cyclone brings the fight from Antarctica’s frozen waterways to its icy shores. With an exciting scenario guide including eight new battles, as well as the supplemental rules for artillery, amphibious assaults, and more, Operation Cyclone includes everything you need to expand your Dust Tactics experience!. Also included in Operation Cyclone are six new terrain tiles, four ammo crates, four tank traps, nine terrain squares, and two amazing new heroes! Amphibious Landing terrain tiles allow attacking forces to pour onto the battlefield, while artillery rules bring a whole new dimension to the game. Leading their forces to glory or the grave, two new heroes also enter the fray.